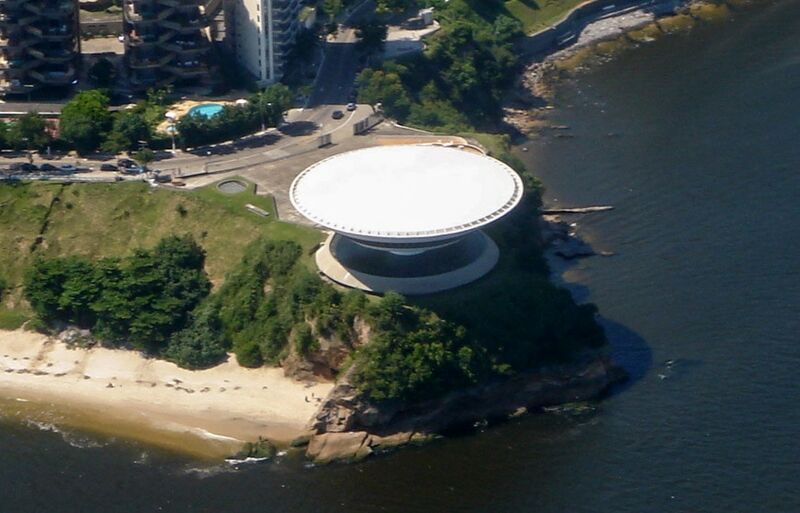 The Museu de Arte Contemporânea de Niterói (MAC) is a museum of contemporary art in the Niterói municipality near Rio de Janeiro, Brazil. 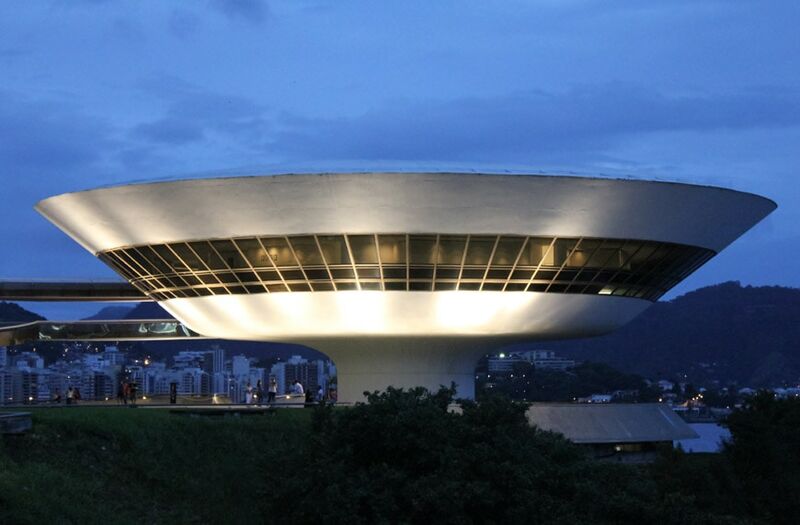 Opened in 1996, the iconic flower-like building of the museum was designed by Brazilian architect Oscar Niemeyer. 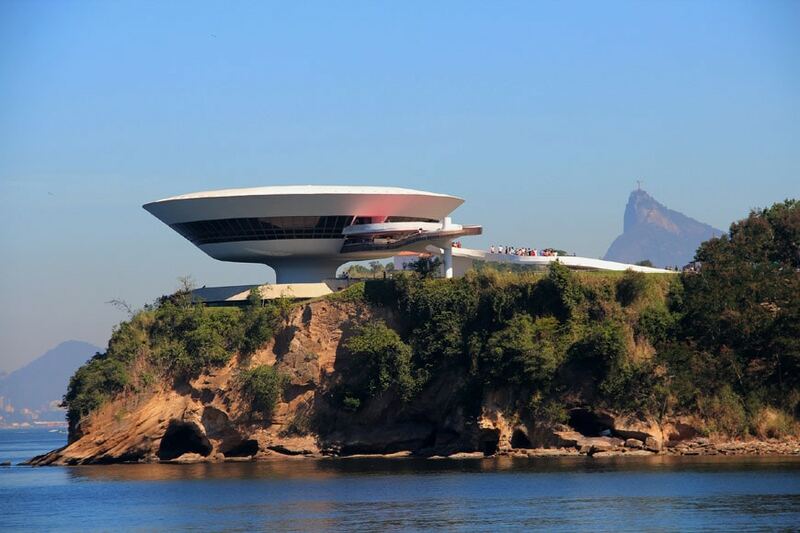 The museum is situated on the Mirante da Boa Viagem, a panoramic promontory overlooking the South Atlantic Ocean, the Guanabara Bay, and the city of Rio de Janeiro. 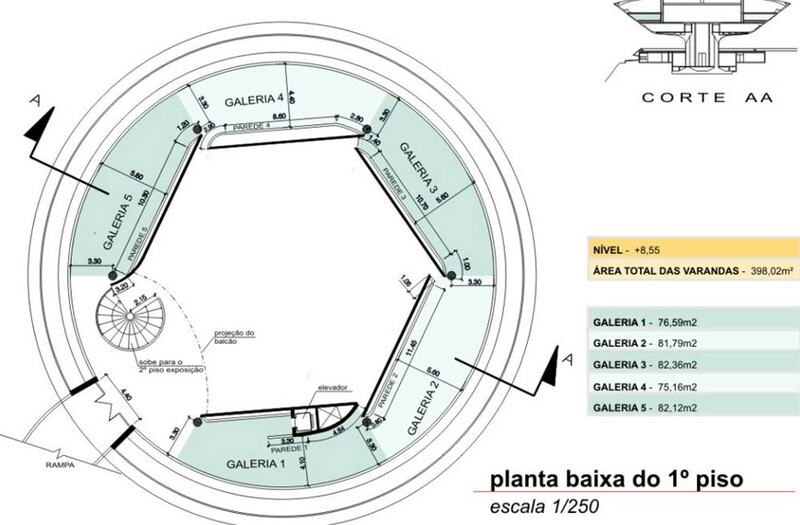 The 2,500.square-meter / 26,900-square-foot building designed by Niemeyer features a peculiar “inverted cone” shape, vaguely resembling a flying saucer, which stands in the middle of a circular pool like a giant aquatic flower. 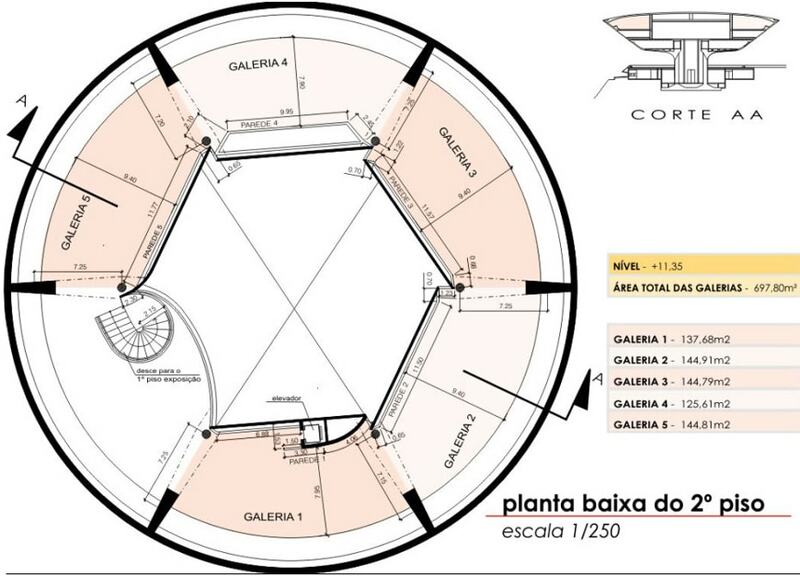 Mostly made of white-painted reinforced concrete, the museum is divided into four levels, connected by a spiral stair. The partially-sunken basement contains storage areas, a cafe, a restaurant, and a small 54-seat auditorium. The first floor accommodates the museum’s lobby and administration offices. The second floor houses five medium-size exhibition rooms and a 393-square-meter double-height exhibition hall. 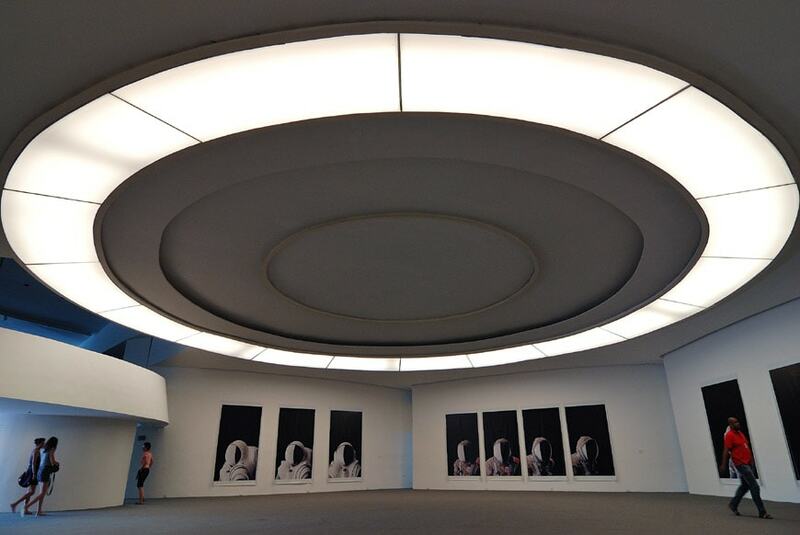 Finally, the third floor, which is topped by a circular dome with a diameter of 50 meters (164 feet), contains nearly 700 square meters of exhibition space, divided into five galleries. Two panoramic “promenades”, each bordered by a continuous ribbon window on the outer side, run on the perimeter of the second and third levels, providing spectacular views over the bay and the city. 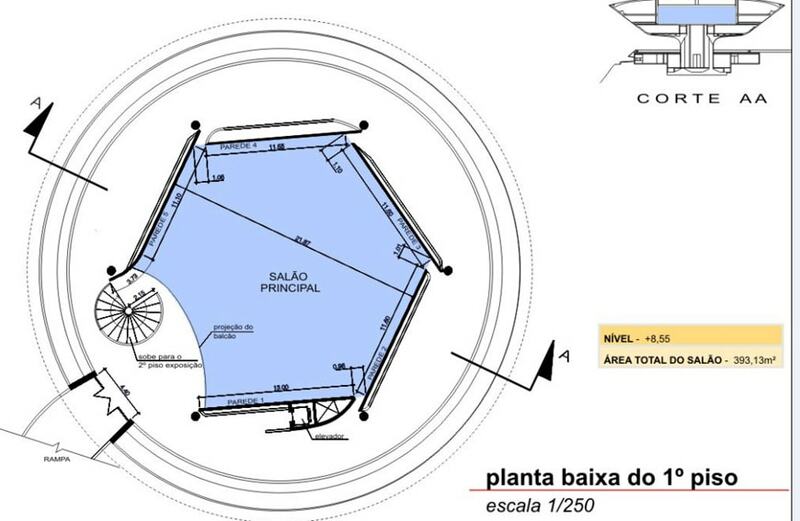 Niterói Contemporary Art Museum, cross section. 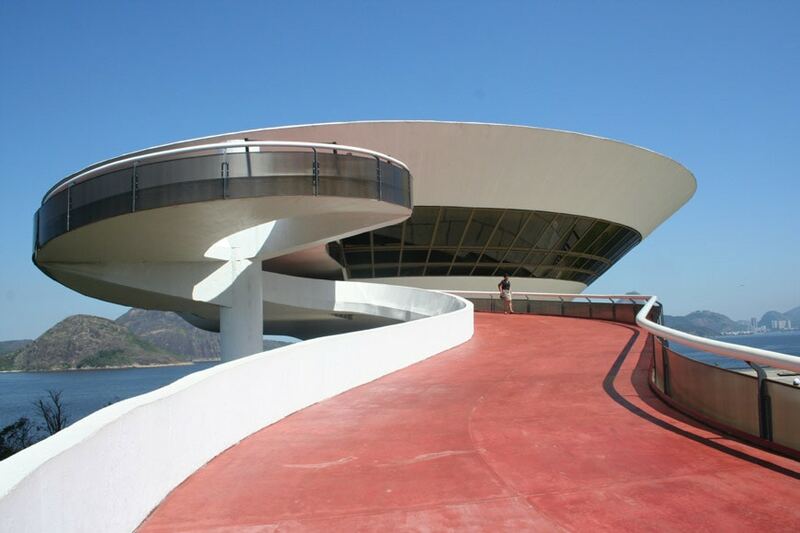 A long, curvilinear ramp connects the Avenida Almirante Benjamin Sodré coastal road to the museum’s entrance on the first floor and the visitors’ exit on the second floor; thus creating a continuous, uninterrupted path throughout public realm and museum which, inevitably, evokes the Guggenheim by Frank Lloyd Wright. 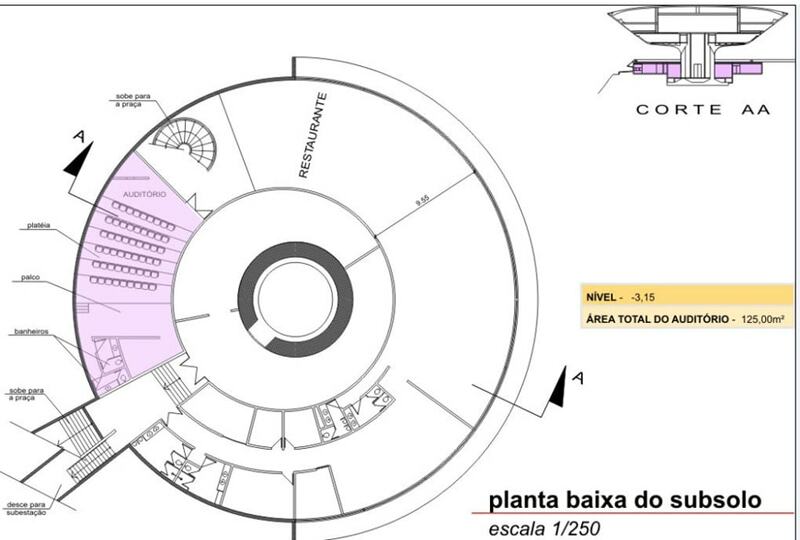 The circular form is recurrent in the museum; the pool, the ramp, the internal balconies, the handrails, even the lamps and the counter of the restaurant, they are all round. 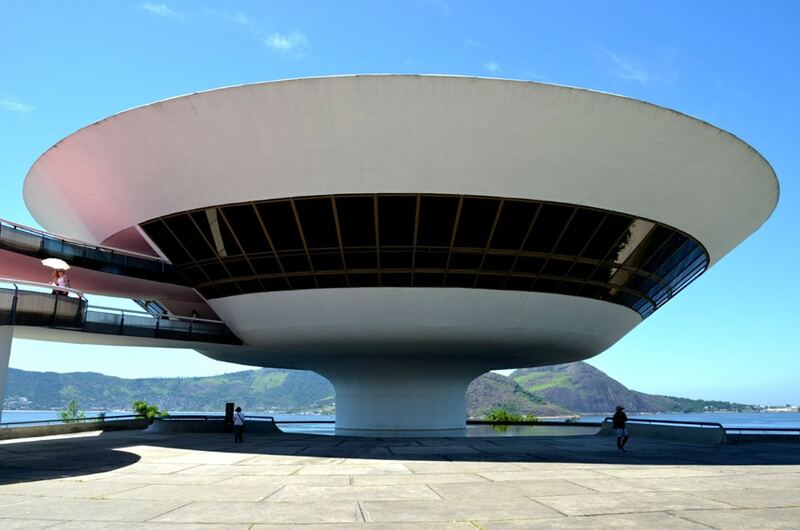 Niemeyer, who was nearly 90 years old at the time of the building’s completion, conceived such an unconventional design to create a building which integrates totally with the landscape, looking like a monumental 16-meter-high tropical flower perched into Boa Viagem’s rocky headland. 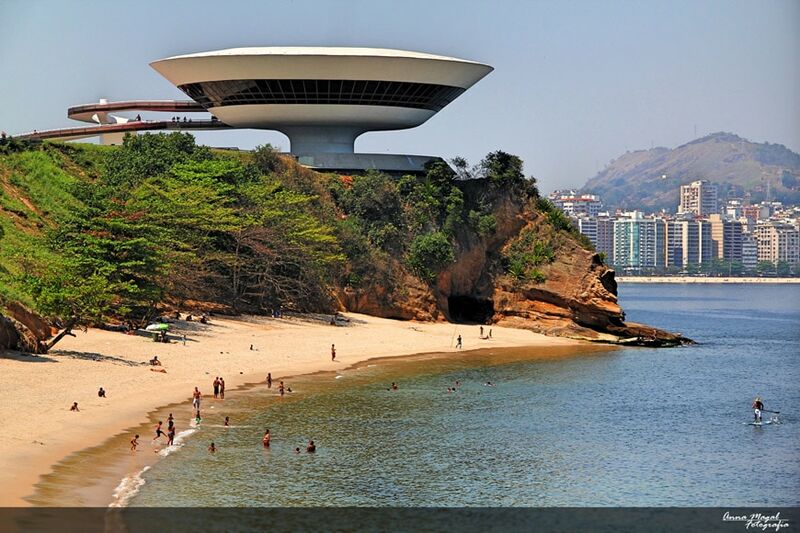 Niterói Contemporary Art Museum, view from the Praia da Boa Viagem beach; photo Anna Magal. 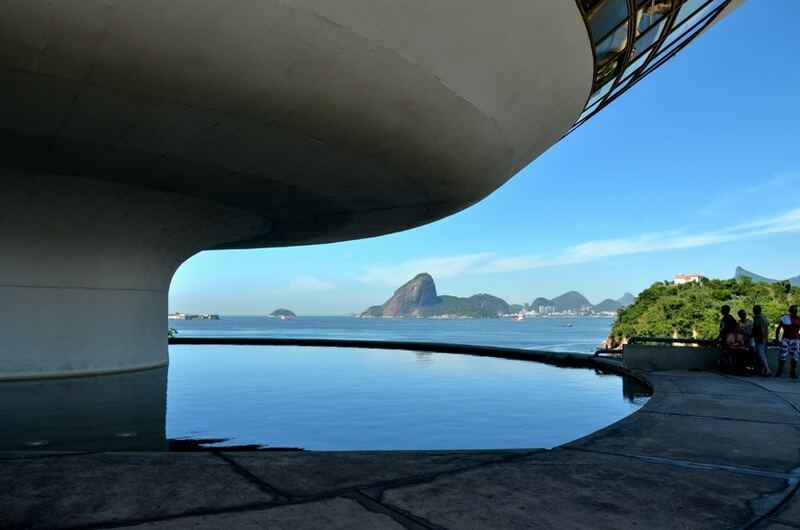 The mission of the Niterói Contemporary Art Musem is focused on “the production of contemporary art, exhibited in a public space open to those who are not part of the art world”. 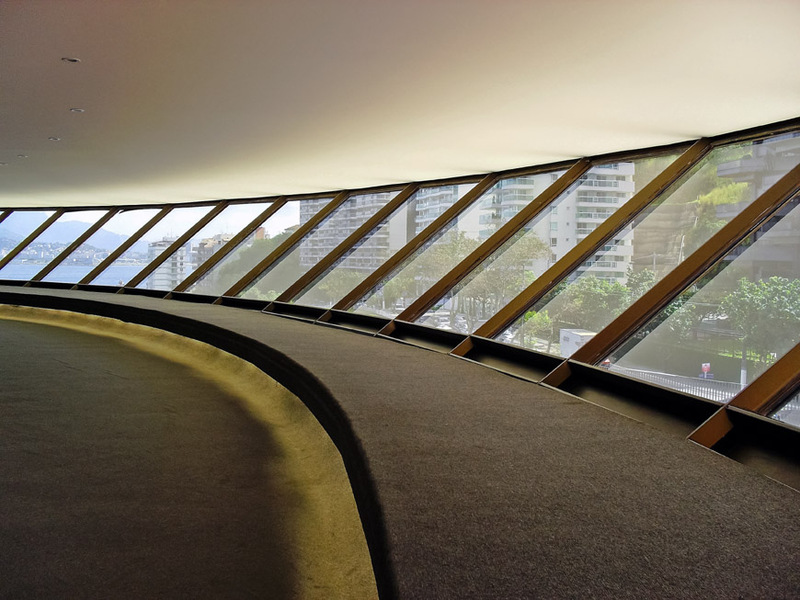 The core of the museum’s collection is constituted by about 1,200 pieces, donated by businessman and art collector João Sattamini and mostly created by Brazilian artists from the1950s to the early-1990s, including works by Lygia Clark, João Carlos Goldberg, Frans Krajcberg, Tomie Ohtake, Abraham Palatnik, Mira Schendel, and Carlos Vergara. The program of activities of the museum includes temporary exhibition, educational programs, and special events. 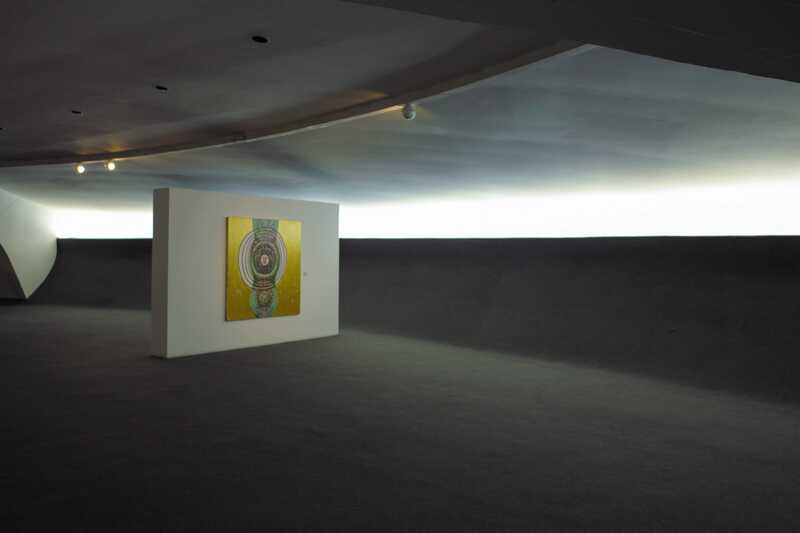 View of the main exhibition hall on the first floor and of one of the galleries on the second floor; photos by Rosino (up) and by The futuristic. 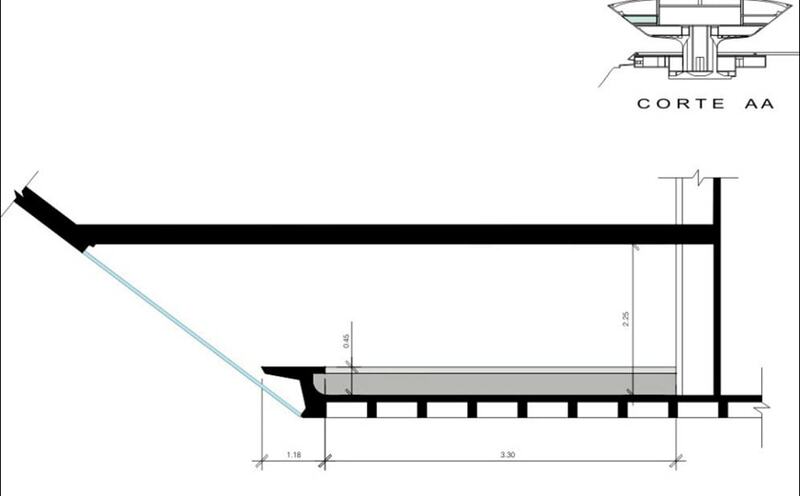 Plan of the basement, first and second levels.